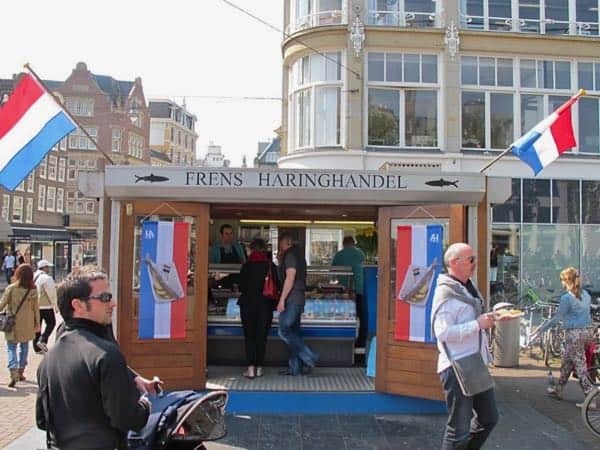 In Amsterdam, fish stands sell raw herring (‘haring’), a soused raw fish with a strong taste. Dutch raw herring is hugely popular in Amsterdam. In Holland, people have been eating raw herring for over 600 years. For foreigners it might be a bit strange to eat a raw fish that has nothing to do with sushi. Herring is a small fish that is very popular among Dutch people. It is caught in the North Sea and the East Sea (near Denmark) from mid May to mid July. Eating raw herring in Holland is best done by holding the raw fish at its tail, see video below. 2. Do the Dutch eat raw fish? The herring has been frozen and then laid in salt for a couple days to ripen the fish (soused herring). So, strictly speaking, it is not raw herring. 3. What does herring taste like? A good raw herring must have soft texture with a nice bite. It tastes and smells fresh and salty. It must be big and have a high percentage of fat (over 15%). Dutch raw herring is famous for being a remedy for hangovers. 4. What is ‘Hollandse Nieuwe’? Raw herring is traditionally eaten with raw onions in The Netherlands. ‘Hollandse Nieuwe’ (Holland’s new herring) is the new herring of the fishing season. It is only allowed to catch herring from mid May to mid July, when the fish are the fattest, getting ready to lay eggs. The first ‘Hollandse Nieuwe’ arrive on the market in the beginning of June. The first barrel of herring is officially and joyfully auctioned in a feast where everyone’s eats raw herring, the raised money going to charity. 5. Is the herring any good this year? The herring is excellent this year. Herrings feed on plankton. And plankton grows by sunlight. So the better the weather, the fatter and better the herring. If spring has been sunny, the herring is of the best quality. 6. Is raw herring traditional food in the Netherlands? Yes. People from Holland (from the West of the Netherlands) have been eating raw herring for over 600 years. Traditionally, eating herring was mostly a practical matter. The fish is rich in nutrients and fat and, when kept in a barrel of salt, it can be eaten all winter. Of course, it meant the fish tasted very salty. It had to be cleaned with milk to get the salt off and eaten with raw onions to get the real herring taste out. Nowadays, the herring can be stocked in salt and frozen, slowing down the ripening process. This way, excellent quality herring can still be eaten in November and December. Dutch raw herring is still eaten with raw onions. In Amsterdam it is typical to eat herring not only with raw onions, but to also add gherkins. 7. Do they eat raw herring in other countries too? Not to big of a fan of raw fish? Have some ‘kibbeling’, deepfried cod with garlick sauce…. Yes, they also eat herring in Germany, but typically in combination with potatoes and a salad or served with cream or yoghurt sauces with onions and gherkins. The Scandinavians eat their herring more marinaded. In Sweden, herring is traditionally served on Midsummer’s Eve. In the North of Sweden they lay their herring to rot in a barrel with herbs for a while before eating, giving the herring a gruesome smell. 8. How do you eat herring? At any fish stand in the street, the soused herring is served on a paper plate with onions and pickles. Generally they chop the fish in little pieces or served on bread (‘broodje haring’). Traditionally however, herring is to be eaten by holding the fish by its tail, dipping it in onions and letting the slippery raw fish then slide into your mouth. Nice post! Can u suggest me where to buy them in Amsterdam? I’d say the best place to buy it is in Utrechtsestraat, on the bridge over Prinsengracht or Keizersgracht (200 m separated). Nice guy as well. There is no such thing as eating ¨raw¨herring in the dutch tradition. These herring sit for months in a salt brine in which the proteins denature to an extent equal to the effect of having been cooked by heat. They are pickled, which is cooking but not by heat. The best ones in amsterdam are the stand in front of the oosterkerk, the fish shop off of the Albert Cuyp market (not the wooden stand on the market, that place is food poisoninf waiting to happen) and the stand on the Zuidermarkt on saturday mornings. But what about “Hollandse Nieuwe”? Are these brined in salt? Or raw? Hello Sara, Hollandse Nieuwe is just regular herring, like explained in the article. It only means they have been fished this year. Can I get Dutch salt herrings sent to me in England? Yes, go to the Fish Society’s website! can you tell us how to make herring netherlands way. I don’t know anything about it really. I live in Amsterdam, so I don’t need a hotel. You can try search with the hotel search widget on the right side of the website. Also, I give tips on cheap living in the post about how to do Amsterdam cheap. Enjoy your time in Amsterdam! Nice post! I just tried them last week in Holland. If you’re ever in Haarlem, try the herrings at the Botermarkt, it’s voted as the best small market in Netherlands. They also have yummy homemade stroopwafels too! Hallo James, I’m a retired chef who knows how to make Ambachtelijke “Van Etten” Croquetten. how do they get the herring skin off the fish….? does it just fall off after brining it? Herring Salted in salted water in barrels is the most common food in Russia. I love it! I miss it living now in Canada. Herring with onion? Never! Herring should be eaten as is. Onion distracts from the herring tast!! B.T.W. Swedish Surströmming isn’t rotten. The flesh is firm. It’s fermented. Big difference, exept for the smell..